Tracey of A Book Sanctuary wrote a post about Hemingway awhile ago, and when I mentioned I’d love to read more of his books she emailed me with a few choices. Having read the required Hemingway (A Farewell to Arms, For Whom The Bell Tolls, The Old Man And The Sea) in my high school Contemporary Fiction class, I decided on A Moveable Feast. The very premise, a book which “captures what it meant to be young and poor and writing in Paris during the 1920s,” thrills me. And so, we’ll be reading this volume of approximately 250 pages in June, and posting our thoughts on June 30. That's very tempting. I think I still have my old copy from an undergraduate class around somewhere. I just may join you. I may! I read this book as an undergrad in college, and it was the only thing that allowed me to like Hemingway after the trauma of The Old Man and the Sea in 9th grade. Loved Hem after this book. It would be great to revisit it! I hope you do, C.B. James. Afterall, we'll have lots of time now that school's over for Summer!Andi, I hope you do, too! No 9th grader has any business reading The Old Man And The Sea, in my opinion. Or For Whom The Bell Tolls for that matter. What do freshman know of such themes? While I consider myself quite mature at that age, Hemingway was definitely lost on me (along with Willa Cather. Let's not even get started on reading My Antonia at age 14…)Anyway, I'd love it if you'd join in. I'll *try* it–that's all I can say at this point. I'm still not sure I can get past hating him for The Sun Also Rises and Old Man and The Sea–both required reads in high school. But I'll try. Becky, those were my required reads in high school, too. Not much that a fourteen year old can relate to in that kind of stuff…I hope you try Feast, it sounds wonderful from what I hear! I just read this a few weeks ago (as I went to Paris) and thought it was brilliant. Enjoy! Chasing Bawa, what a perfect thing to do! Matt, of A Guy's Moleskine Notebook, is doing the same thing: reading A Moveable Feast before his trip to Paris at the end of June. You lucky ones! What could be better than lit walks in Paris? Or, Paris in the 1920s? I forget books that I've read all too frequently. Now that I'm readying approximately 8 a month, I can no longer keep them separate. My friend asked me last night, "What are you reading?" and for the life of me I couldn't give her an answer. They all seem to blend together, which I'm not altogether certain is a good thing.At any rate, I'd love to have your join in with your thoughts after flicking through the pages again, Stu. Oh, I need to read A Moveable Feast! If I can squeeze it in, I will. 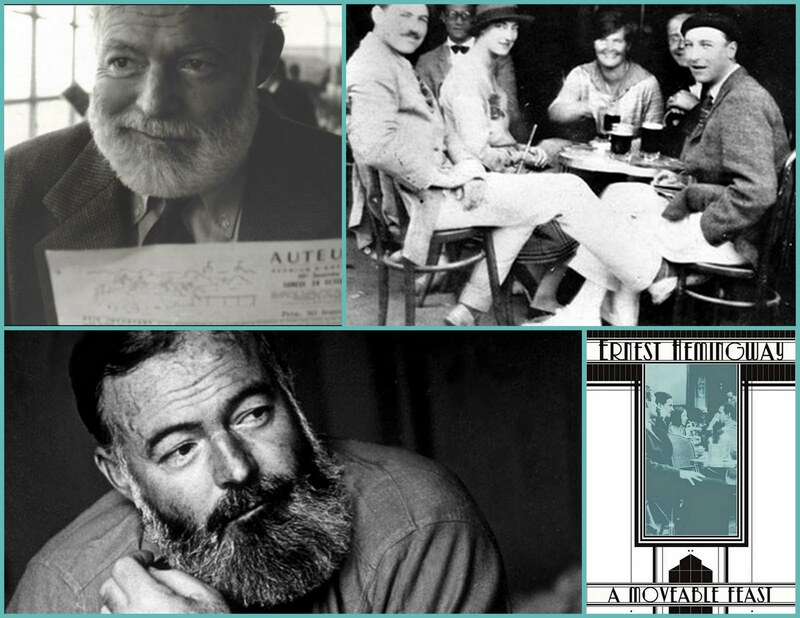 A Moveable Feast is on my list for Paris in July…. I'm very tempted! I cannot participate in the readalong but will look forward to your posts! SimpleImages, that would be wonderful! I'm not sure how you found my blog, but I'm glad you're here, and I hope we can share lots of book thoughts together.Kathleen, that's one of the best things about blogging. When one can't read the book itself, one can at least participate in the convseration. Looking forward to your presence in any way you can make it known.Audrey, how lucky you are! I didn't know that you're going to Paris with JoAnn (our JoAnn, the blogging friend?) And, I love the last three terms you used! Did you see Winston's Dad's (Stu) post on The Most Beautiful Walk In The World? That book by John Baxter looks like a must read, too, especially if you're going so soon. I just might… my interest in this book has been stimulated after watching the movie "Midnight in Paris". You must go and see it Bellezza. I'm sure you'll be much amused. Arti, I wish you lived closer so that we could go to movies together. I love good movies, which you always know about, and my husband doesn't go to them. Ever. (Could it be because he can't flip channels in the theater?) Anyway, I'll look up Midnight in Paris because its name, and your recommendation, make it so compelling. Thanks. I just bought this book. I'll join in, but I'd better get to reading! Debbie, I haven't started it myself. We'll have a busy few days at the end of the month, I suspect!